They’re among the last visible icons of a dramatic bygone era. They stocked the shelves of America’s early merchants and traders, kept communication flowing into many of the most remote reaches of the frontier, and helped open the West with the new-found wealth of the nation. These were the Freight Wagons. Built for a single profit-driven purpose, they were designed to take a literal beating while carrying massive amounts of goods, supplies, equipment and raw ore. But, creating these designs was just the first step in a long line of business logistics and challenges. Before the goods and raw materials could arrive at their destinations, they had to overcome the demands of poor and non-existing roads. Even considering all of the frustrations involved with delivering goods on an international scale today, nothing comes close to the adversity that met America’s early western freighting industry. Poorly maintained, steep, narrow dirt paths with axle deep mud, washed out chasms, and an endless array of unforeseen problems were matched only by scenic routes with stomach-curdling drop-offs overlooking deep, mountainous ravines. Crossing mile after mile of secluded country, these slow-moving, heavy wagons were constantly twisted, racked, and pounded along the trails. Adding to the pressure, there were no emergency roadside services to call for help, no regularly-spaced convenience stores to replenish themselves and their teams with food and water, and no protection from bandits and renegades looking to take full advantage of an isolated caravan. It was not an occupation for the faint of heart or the indecisive. Here, strong men with even stronger resolves wore hardened faces and the added savvy of a backcountry survivor. When confronted with cantankerous mules, their vernacular could be explosive and unashamedly colorful. However, they also had a softer side – especially when it came to caring for the animals they spent so much time around. Their livestock and equipment were their primary means of sustenance and that fact was never far from any of the day’s thoughts. Averaging about 15 miles per day in hill country and 25 a day in the flatlands, the first of these western freighters is usually traced to 1821 and the efforts of William Becknell to open the Santa Fe Trail for increased commerce with the New Mexico region. Because they traveled some of the most torturous terrain ever conquered on four wheels, it’s understandable that the abuse and ravages of time have left very few of these vehicles for modern eyes to witness. Perhaps that’s why each year on Labor Day weekend more than 20,000 people gather in Ketchum, Idaho for the annual Wagon Days Festival. It’s an event started almost a half century ago to commemorate the area’s heritage and link to the old west. The highlight of the event is the parade and display of six giant ore wagons. Built in 1889, these Goliath-sized creations are a direct connection to America’s legendary western heritage. 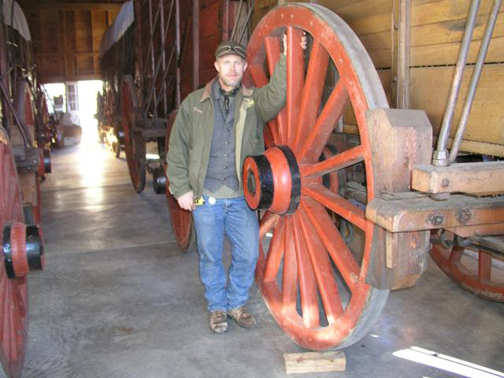 They represent some of the biggest, toughest, and most impressive vehicles that ever traversed the American frontier. Just walking up to the wagons reminds one of the enormous tasks confronted by our pioneer ancestors. Resting on a mammoth foundation of seven foot tall rear wheels, four inch wide steel tires and an overall height - with canvas - of fourteen feet, the vehicles carry an impressive display of strength and determination. Individually, these wagons stretch some sixteen feet in length and include a monstrous interior capacity totaling 250 cubic feet. The dimensions translate to a vehicle capable of carrying about 9 tons of cargo. Even standing empty, the wagons still weigh a ground-crushing 6,400 pounds. Comparably, the wagons are similar in weight to a typical full-size, heavy duty pickup truck - but with about four times the payload capacity. A strong indicator of the impressive loads carried by these wagons, the brake blocks themselves are massive carved wedges positioned just in front of the rear wheels. Nearing 3 feet in length, these huge wooden chocks were oversized to enable a stronger ‘bite’ on the wheel thus delivering better control when traversing hills and across uneven terrain. In addition to the wooden brake blocks, freight wagons like these also used rough locks and drag shoes to help safely slow their descent on especially steep grades. A rough lock was a short-link chain or iron bar with chain looped around the felloe of the rear wheel(s). Drag shoes – sometimes called ‘wheel shoes’ - served a similar purpose but allowed the wheel to “ride” in the slot of the shoe (see photo). In both methods, the rear wheels were tied off to the wagon, but a drag shoe had the added benefit of preventing the tires of the wheel from wearing a flat spot in one area while skidding down a slope. Unlike lighter-weight farm wagons, the operator of these large freight teams did not ride in the wagon. Instead, every ounce of space was reserved for ore and supplies. Riding on the rearmost horse/mule on the left side (nigh wheeler), the freight operator or ‘skinner’ controlled the team and wagons from one location. Because freight wagons were often hooked together to form a lead wagon and subsequent trail wagons, other men would sometimes ride on the sides of the successive wagons to help control additional operations including braking. So grueling was the job of carrying the ore out of the Idaho interior that these huge wagons were typically drawn by a long stretch of 14 to 24 mules on a jerkline. Jerklines were single reins that ran from the driver through rings in the near-side harness of the teams up to the near-side bit of the leader. 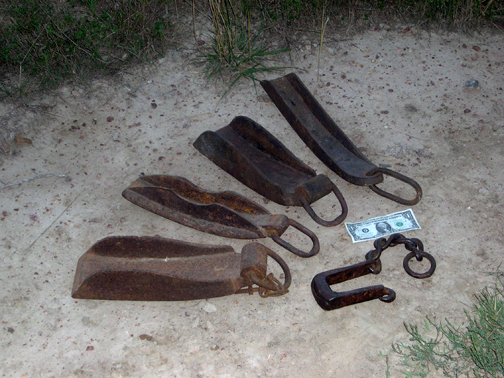 The lead mule was connected to the off (right-side) leader by a jockey stick and trained to turn right with one steady pull on the line and to the left when short jerks were made. It was a natural extension of the task to call the operation a ‘jerk line’. The wagons were often loaded using a calculation of about one ton per animal. 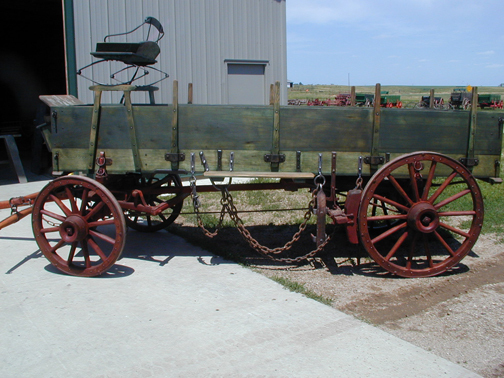 The big mules were expected to at least pull enough payload to equal their own weight – hence the origin of today’s phrase, “Pull your own weight.” According to Ivan Swaner, a local expert on the Ketchum wagons, the Wagon Days Association was started in 1958 to celebrate the early mining era in the surrounding Wood River Valley. “These are the last of the great ore wagons,” says Swaner. “They were used until 1909 to haul gold, silver and lead ore from the backcountry mines in Idaho.” Swaner points out that the freighters followed a circuitous 180 mile route that took a full two weeks to complete. Horace C. Lewis was the owner of the freight wagons. Born in 1858, Lewis had operated his own freight line for several years before he created the Ketchum Fast Freight Line in 1884. With at least 30 outfits comprised of approximately 200 mules and a number of ox teams, Lewis’ wagons heavily traveled the country between Ketchum, Clayton, BayHorse, Challis, Custer and Bonanza, Idaho. In one season, the Lewis wagons reportedly hauled an incredible 700,000 pounds of ore and silver bullion to the railroad for shipping. 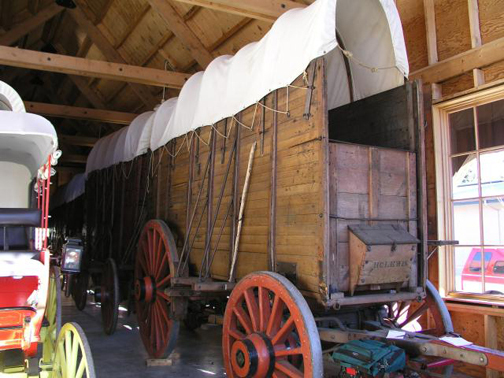 While a number of legendary wagon makers like Studebaker, Bain, Schuttler, Weber and others catered to freight company vehicle needs, these specific wagons were built by the smiths and woodworkers of Horace Lewis’ own shops. 2006 marks the 117th birthday of these still incredibly solid vehicles. Looking at them, it’s not hard to find ourselves wondering if we too would have had the same vision and strength to have faced such daunting physical tasks. In today’s modern world, the business of shipping products, materials and information has never been easier. Armed with an expansive interstate highway system, express airline services, satellite communications and instant computer-tracking capabilities, the shipping business has become extremely sophisticated and organized. But, even with such high levels of service, we often still find ourselves wondering why something couldn’t be here yesterday. Today, consumers are trained to expect instant gratification and it’s created a never-ending battle to transport goods from point A to point B faster, cheaper and better. While today’s shipping companies spend a great deal of time and money creating better logistics and greater efficiencies, the bottom line is still the same. Goods still have to make it to the manufacturer and marketplace in order for commerce to be successful. It’s a reminder that no matter how far we travel some things never change. Through it all, history has much to share and we - always have more to learn. Smaller than the giant freighters, this type of California Rack Bed wagon was also used to haul a variety of freight - including raw ore - in the Old West. Note the Drag Shoe and Rough Lock Chain hanging from the side of the wagon.